Matthew Rutledge Schaub was born on 25 June 1981, in Pittsburgh, Pennsylvania USA, and is a professional American Football player, known for playing in the National Football League (NFL) for the Atlanta Falcons and for other teams such as the Oakland Raiders and Houston Texans. All of his efforts have helped put his net worth to where it is today. 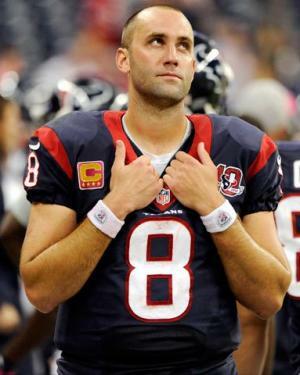 How rich is Matt Schaub? As of early-2017, sources estimate a net worth that is at $40 million, mostly earned through his career in professional football. He reportedly earned around $22 million annually as part of a previous contract. He’s been well known since his college football days at the University of Virginia, and as he continues his career it is expected that his wealth will increase. Matt attended West Chester East High School and during his time there lettered in baseball, basketball, and football. After matriculating, he went to the University of Virginia and became part of the football team, the Virginia Cavaliers. He red shirted his freshman season and became a starter during the 2001 season. He alternated playing time with Bryson Spinner and the strategy worked for the team. The following year, he would have his breakout season and would earn numerous awards; he was set to be a Heisman candidate in the 2003 season, however an injury hampered his progress. Despite that, he was named as the Most Valuable Player in the 2003 Continental Tire Bowl. He was also awarded the Ben Wilson Award and the John Acree Memorial Trophy. In 2004, Schaub joined the NFL draft and was selected as the 90th overall pick by the Atlanta Falcons, making him the fifth pick of a quarterback-rich class. He would start to gain popularity in 2005 after becoming the Most Valuable Player in the American Bowl preseason game, however, he was traded to the Houston Texans in 2007, ans started getting better at his role and the Texans set him as a long term starter. His net worth also increased, however, 2007 proved to be a season plagued with injuries for him. He returned in 2008 but had mixed results though by mid-season he started getting into his stride. The following year, he led the Texans to a 9-7 winning record, the first in the team’s history, and was selected as an injury placement in the Pro Bowl and won MVP honors. In 2011, he then led the Texans to a very successful season, getting a 7-3 record, however, a Lisfranc injury did not allow him to play in the playoffs. In 2012, he signed a four year, $62 million deal which increased his net worth significantly. He was invited to the 2013 Pro Bowl after great performances, however, in the following season he suffered another injury that only allowed him to play 10 games. In 2014, he was traded to the Oakland Raiders and was released in 2015. He then signed with the Baltimore Ravens for a one year $2 million contract but only played 2 games because of a chest injury. He returned to the Falcons in 2016, and signed a one year contract with them. For his personal life, it is known that Matt has been married to Laurie since 2008, and they have three children together. 1 Quarterback with the Atlanta Falcons (2004-2006) and Houston Texans (2007-present).